We love our pets, and animals in general. Is there one about which a movie hasn’t been made? In most cases they are sources of entertainment, if not love. Unfortunately, they are still animals, and on occasions instincts kick in. When this occurs, we find ourselves in danger. Today’s post reviews the dangers of various animal bites. 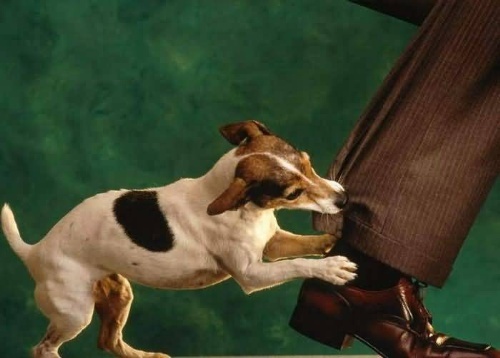 Dogs bite almost five million people yearly, resulting in 800,000 visits to a healthcare provider. Injuries are highest for kids between ages five and nine. Most dog bites are to the upper extremities. (Imagine yourself reaching out, petting or slapping a dog.) However, in kids most injuries are to the head and neck. (They’re smaller.) Here are some tips to avoid getting bitten. If you’re considering bringing a dog into your family, remember that dogs or dog breeds with histories of aggression are inappropriate in households with children. (I’m talking to you, pit bull owner.) Also, spend time with a dog before committing. If your kids are afraid of any individual dog, hold off. That fear may create cues the dog will pick up on and create a self-fulfilling prophecy. Spaying/neutering a dog actually reduces aggressive tenderness (no puns necessary). Once you’ve acquired a pet dog, please never leave infants or young children alone with the dog. Train your dogs, focusing on submissive behaviors. Do not wrestle or otherwise become overly aggressive with your dog. If your dog develops aggressive tendencies, either get better training or remove the pet from the household before it’s too late. Don’t disturb your pet if sleeping, eating or caring for puppies. Also, avoid staring down your or any dog. Regarding dogs you don’t know, don’t pet any new dog without allowing it to see your hand and smell you beforehand. Do not run away screaming from a dog; in fact, if you’re approached by an unfamiliar dog, your best move is to remain motionless. If you trip or fall over, roll into a ball and lie still. 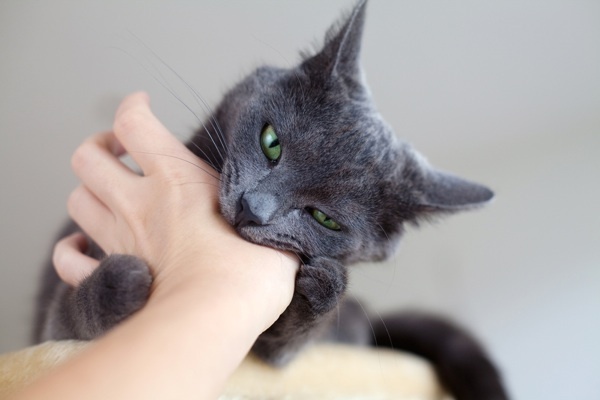 In general, cat bites and scratches are much worse than dog bites. Cat bites and scratches are more of the puncture wound variety, seeding and walling off very infectious bacteria deep inside of you, which then grow and cause infections. (Dog bites are more of the ripping, tearing variety, which poses different problems, but they aren’t as dangerous from an infectious disease standpoint.) Cat bites cause skin and blood infections. You’ll know this by warmth, redness, pain and pus from the wound site. 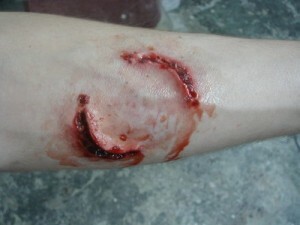 Below is a depiction of an infected cat bite wound. Fever may also be present if the infection is severe enough, and yes, cat bites can be fatal if untreated. You may have heard of “cat-scratch fever.” It’s a real phenomenon. 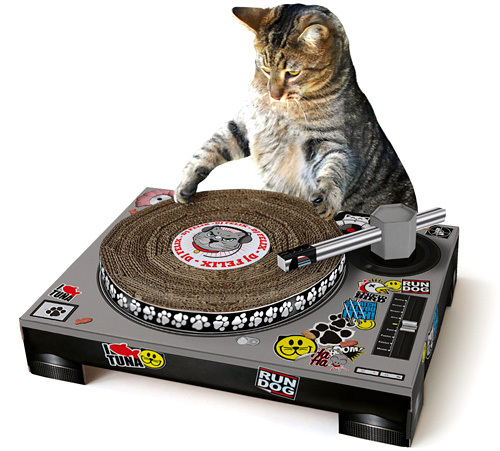 Forget the lead picture; here’s a real picture of cat-scratch fever. All bite wounds should immediately be washed under high pressure running water, but you want to avoid any scrubbing. Applying pressure to bleeding wounds is important. Time is also important. Both cat and dog bites need to get evaluated. Expect to receive antibiotics in the vast majority of cases. Some bites will require stitches; others will not. That’s a decision for the medical professionals. Treatment may include tetanus and rabies vaccines. Get in and be seen, especially with cat bites/scratches, which can cause loss of life and limb if not dealt with rapidly and effectively. 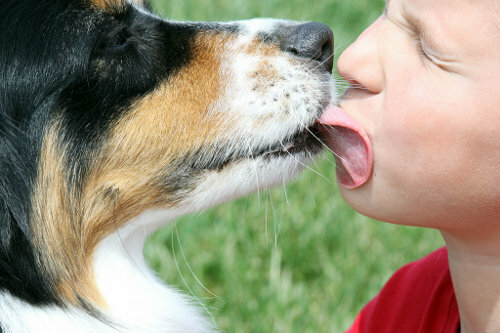 By the way, since this is my blog, I’ll just say stop it with letting your dogs lick you and kiss you in the mouth. That’s just nasty (and that’s medically speaking). Don’t you know where their mouths have been? 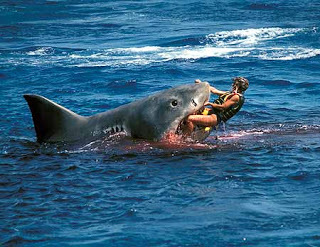 Shark bites are the things of legends, thanks to movies like Jaws and The Deep Blue Sea, which gives the impression that sharks are serial human killers. In fact, there are about 100 shark attacks worldwide yearly, with about 15-20% of attacks being fatal. I doubt that most Straight, No Chaser readers will be shark bait anytime soon, but the first thing I will mention that’s important to know is unlike other attacks by potential predators, playing possum doesn’t work with sharks. Fight back and fight dirty, attacking the eyes and gills. Apparently, sharks like easy food. In case you’ve ever wondered, sharks aren’t biting you because they’re hungry but because they’re curious. They don’t encounter humans often and similar to how a baby puts about anything in its mouth, sharks will take an “exploratory bite.” The typical human who swims frequently enough to be in shark infested waters isn’t obese enough to keep sharks’ interest and be a focus of their diets, particularly with so many other options. The other curiosity about sharks is after that first nibble, they tend to back off and wait for prey to die before returning for the kill. They don’t seem to like fighting wounded and aggressive victims. Rather lazy, I’d say. 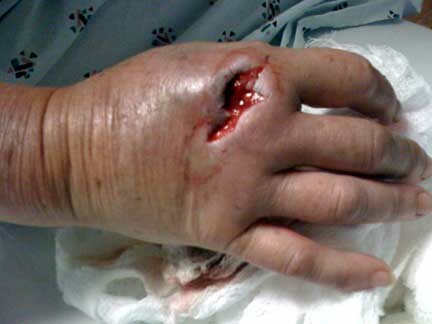 The real danger in shark bites is the amputation. Single bites of arms and leg can cause enough blood loss and subsequent infection to kill you, just like any other amputation. Obviously a bite to your skull, chest or abdomen can kill instantly. Treatment primarily involves aggressive fluid resuscitation and other life-supportive measures, along with assessment of infection risk with antibiotics as necessary. Yesterday’s blog on human bites is an important; it’s that frequent and important. For now, understanding that the human mouth is especially dirty and dangerous should hold you over. (Yes, it gets a lot worse than the above picture.) In the meantime, pay attention to your household pets and use the tips mentioned to avoid infection.